It is near impossible to find a bad cup of coffee in Paris. Ahh.. the famous Angelina's restaurant and tea house, where serving hot chocolate, tea & coffee is a high art. I heard so many things about this café, from so many acquaintances, that I just couldn't pass up the opportunity (seeing that our hotel was so close) to sit down and enjoy a cuppa. . I'm not a tea connoisseur by any means, and I much prefer a good, strong café crème or an invigorating un petit café (espresso); and let me tell you, they've perfected the art of serving coffee at this here fine restaurant. But silly me, I neglected to hone up on my Parisien café terminology, and I only received a confused look when I ordered "un café au lait." Even more confusing was when they brought me my black coffee with a side of whipped cream. 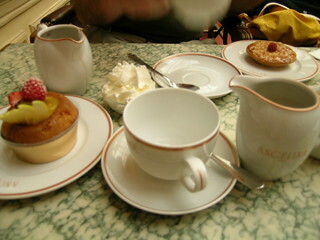 Needless to say, the coffee was great, and so were the delectable pastries...yum!